This entry was posted on May 19, 2013 by admin. At Fifth National Clinical Conference on CannabisTherapeutics, April, 2008 in Pacific Grove, CA. 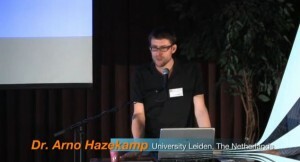 Arno Hazecamp, PhD, commission by the Dutch government's Office of Medicinal Cannabis, researches chemical composition of cannabis tea, finding relatively high concentrations of THCA (THC Acid) rather than THC (decarboxylated). Conference sponsored by University of CA's School of Medicine, and by Patients out of Time.